News: Bloodstock Festival announces Sunday night headliner for 2019! Bloodstock Festival announces Sunday night headliner for 2019! 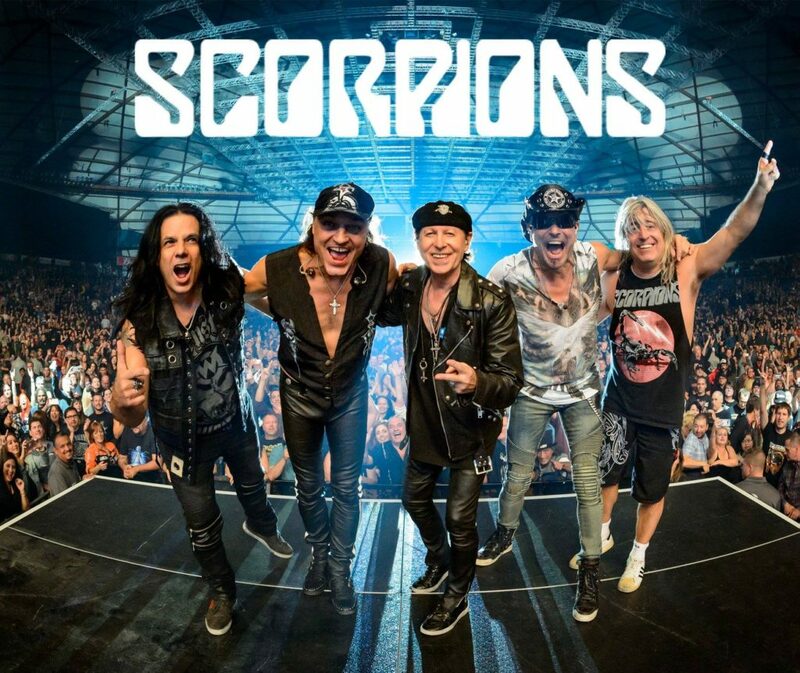 SCORPIONS have notched up 18 studio records, including 2015’s ‘Return To Forever’ and have sold over 160 million albums in their 50+ year career. With frontman Klaus Meine at the helm, the band’s line up features legendary axemen Rudolf Schenker and Matthias Jabs, bassist Pawe? M?ciwoda and former Motorhead drummer Mikkey Dee who now sits behind the drums after stepping into the role in 2016. 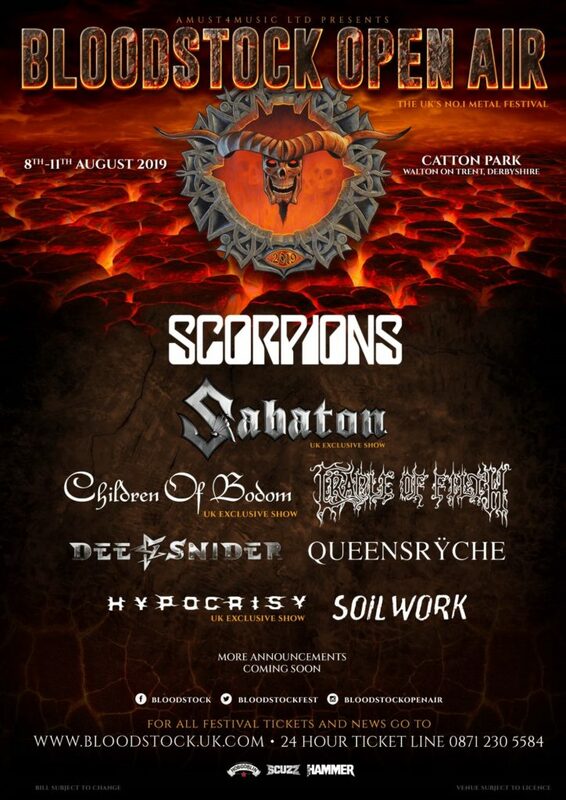 SCORPIONS join the previously announced Friday night headliner, SABATON, together with CHILDREN OF BODOM, SOILWORK, CRADLE OF FILTH, DEE SNIDER, QUEENSRYCHE and HYPOCRISY on the Catton Park stages next August. Stay tuned for more bands to be announced soon! Standard weekend tickets are currently available at ‘early bird’ prices (just £132 for four days of metal fun), so grab yours now at the ticket store – http://bloodstock.seetickets.com – to save a few quid. Camper van passes are also available in limited quantities, but be quick, over half the available spaces have sold already! For those who want their VIP spot guaranteed, BLOODSTOCK’s first wave of 2019 Serpents Lair VIP tickets are also available priced at £290. A second wave, including the Deluxe VIP packages (Luxpads, Bellepads, Podpads, etc) and a limited amount of VIP upgrades (for those who’ve already purchased standard weekend tickets) will then become available on 16th December at 9am. 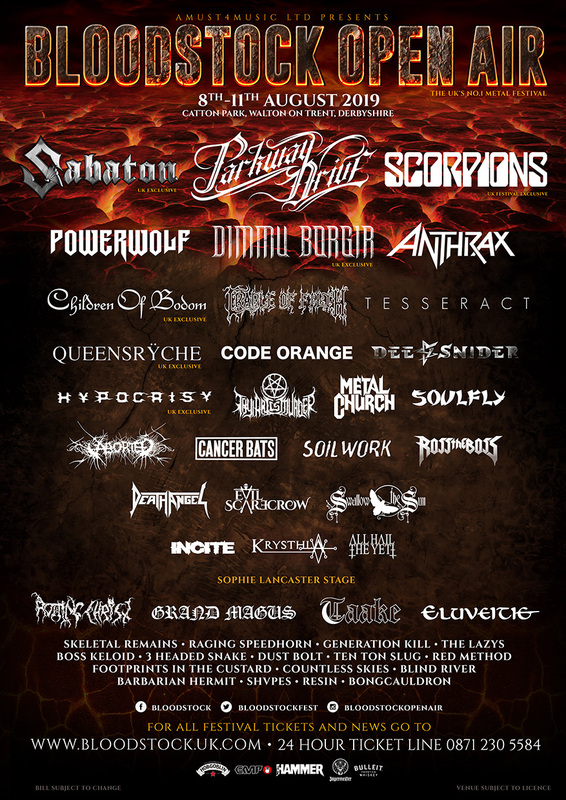 For full details click to: http://www.bloodstock.uk.com/pages/vip-camping. 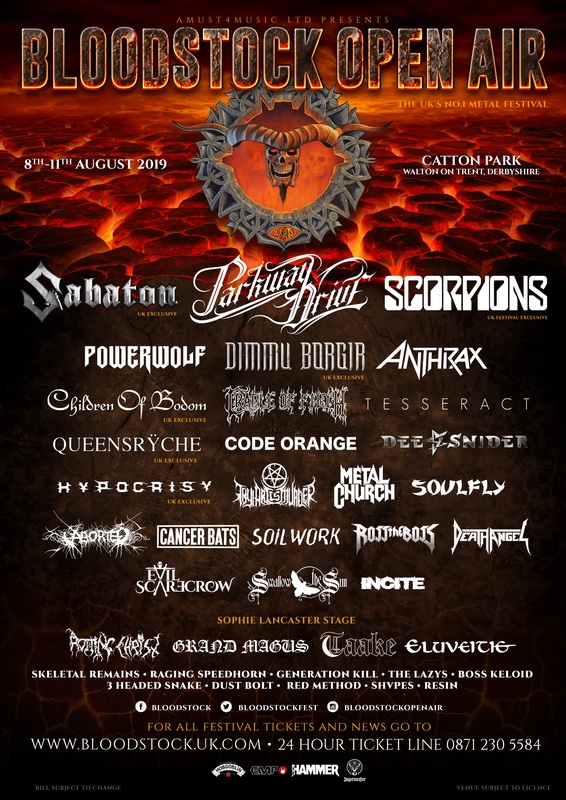 BLOODSTOCK will take place at Catton Park, Derbyshire on 8th-11th August 2019. Get additional information over at www.bloodstock.uk.com.